How useful Is Digital Signage for Convenience Stores? Convenience stores / C-Stores are thriving despite growing acceptance for the easiness in online shopping. Speed being everything in today's world, these large number of customers, who still love to store-shop, expect quick and affordable services in stores. 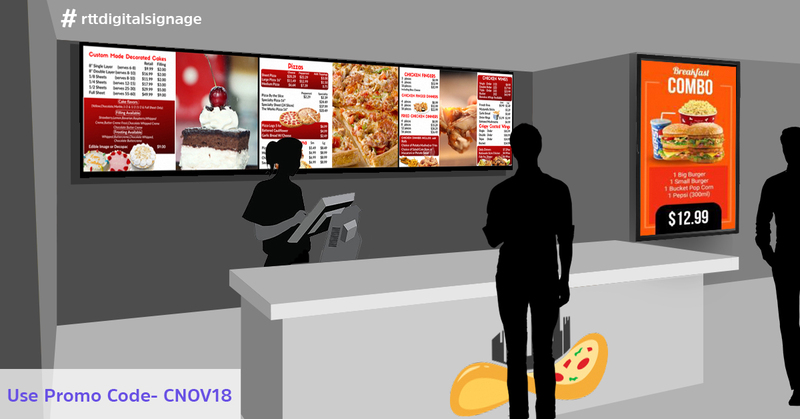 Digital Signage can be a game changer in this scenario amid various marketing strategies to ultimately boost sales. The more convenient, cost effective, and easily updatable digital sign boards help convenience stores, which stock almost all everyday items from groceries to over-the-counter drugs, in more than one ways. The beautifully laid-out digital displays with images and videos grab the attention of on-the-go customers, giving them first impression of what is in store. New arrivals and specialty products could be displayed with much ease, giving up-to-date information. In stores, majority of customers are interested in various offers and other promotional content, which could be displayed digitally on time, and in an inviting manner. The wide display of items encourages increased spending, resulting in better sales. Digital displays with their loads of information and visuals engage customers, reducing the feeling of long wait especially in rush hours. Such displays will entertain and enhance customer experience. Along with the information of store contents, sign boards could display general information and other titbits to grab customer attention. Digital sign boards are a cost effective way for marketing. It is more convenient and easy to use as changing screen presentation and content is just a click away. The easiness in placing boards on store walls helps to save valuable store space on the floor. It also can reduce labor at the store level. In addition, the technology behind digital signage is simple and could manage easily and more effectively. In a highly competitive convenience store industry, digital signage gives any store the much needed extra edge. With easily customizable, high-resolution screens, stores can grab customers' attention and cater to their special needs. Not only that, displaying useful general messages and activities of local community will attract local customers. Studies show that digital signage and supporting technologies help in boosting sales as well as brand loyalty significantly. The up-to-date information about new products, offers, other promotions and services help the stores gain the competitive edge, and also encourage customers to repeat their visits. How RTT Helps Convenience Stores To Increase Sales?